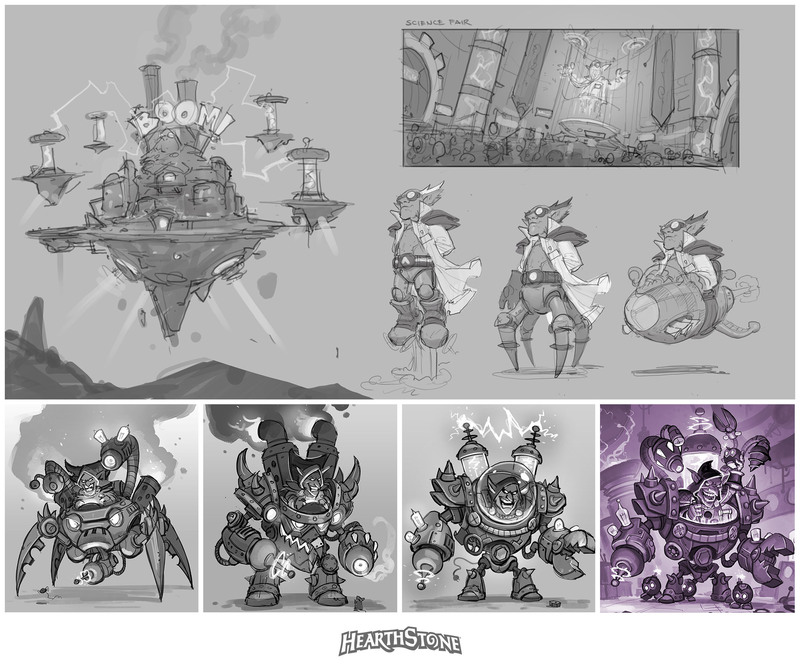 Before they found their way onto cards and artwork, the brilliant scientists, crazy contraptions, and magnificent mechs you see in The Boomsday Project sprang forth from the over-active imaginations of Blizzard artists. 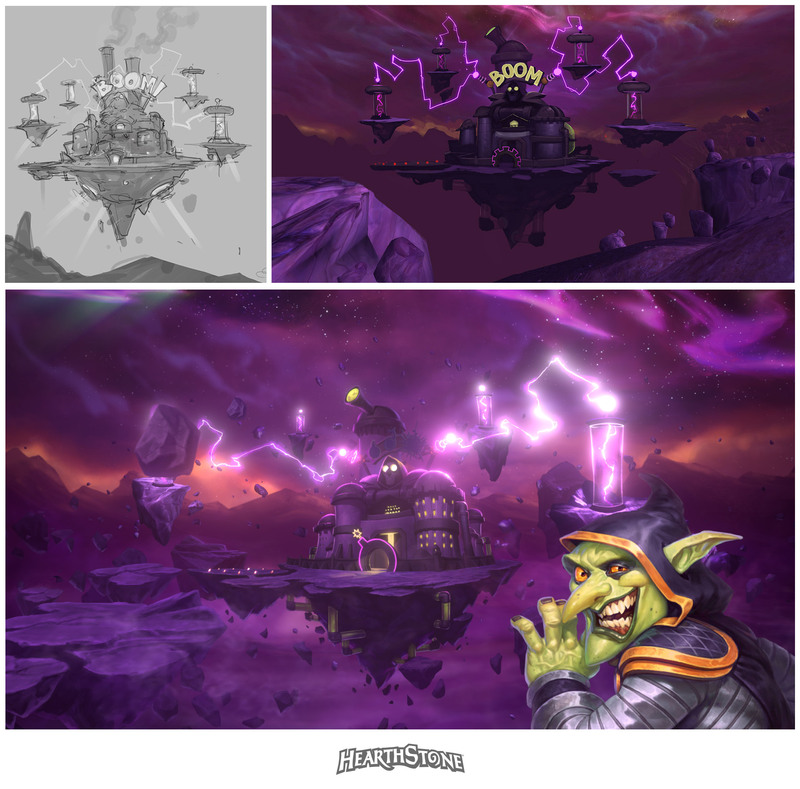 Today we’re sharing some of The Boomsday Project’s concept art and revealing what original Hearthstone art looks like early in the creative process. 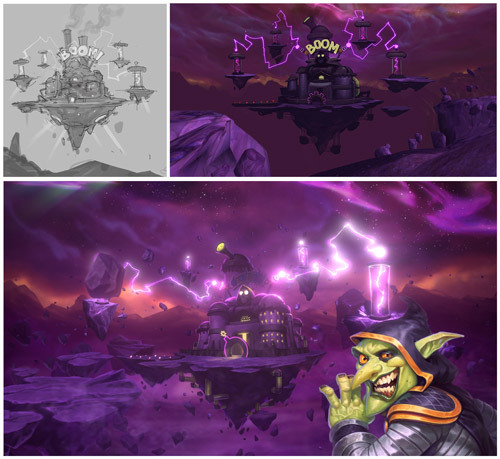 Above is the first take on Dr. Boom’s Netherstorm lair, which immediately captivated the imaginations of the design team and captured exactly what we were after. 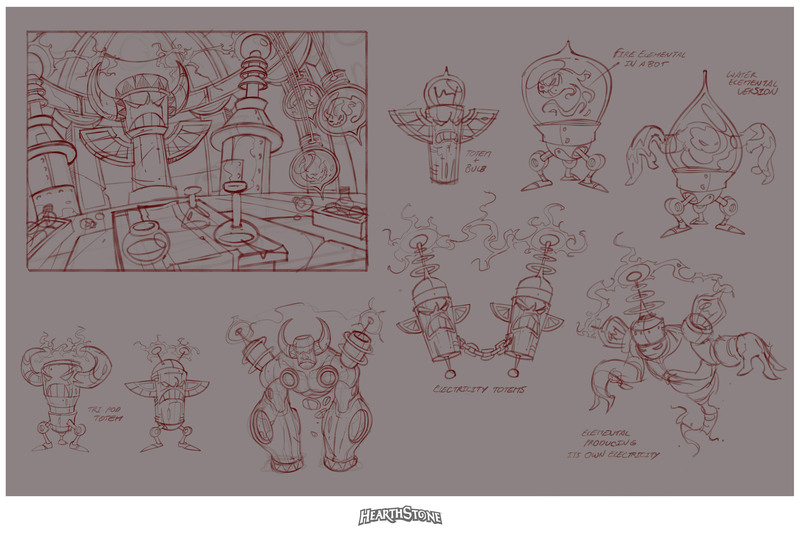 We knew Dr. Boom would have a mechanical conveyance, but originally his art was going to be updated to emphasize his mad science credentials. 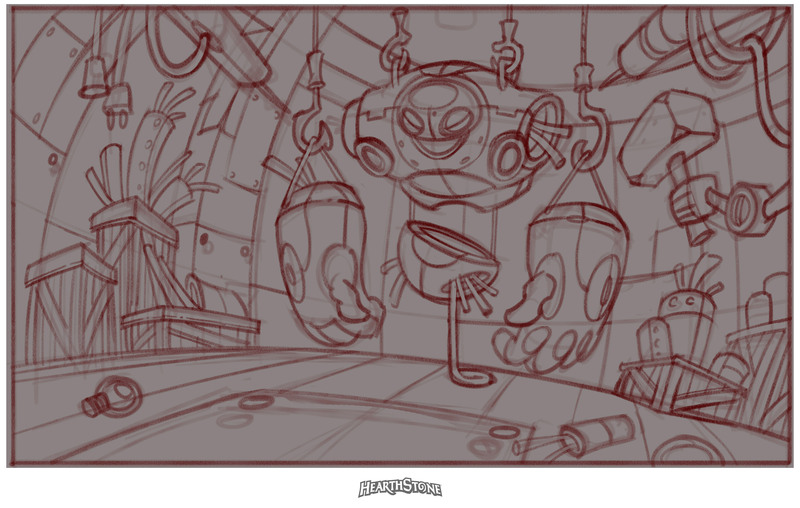 Ultimately, it felt better to keep Boom true to his roots, so he kept the hood and the mech suit was born. 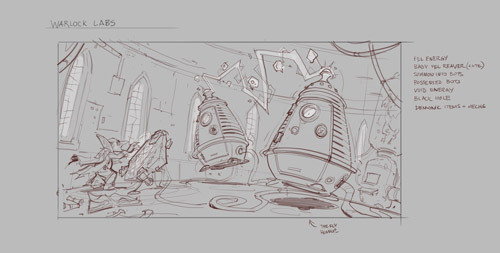 The Cinematic team captured the spirit of the initial lair sketch perfectly, and it became the centerpiece for the mayhem that was to follow in the announcement cinematic piece. 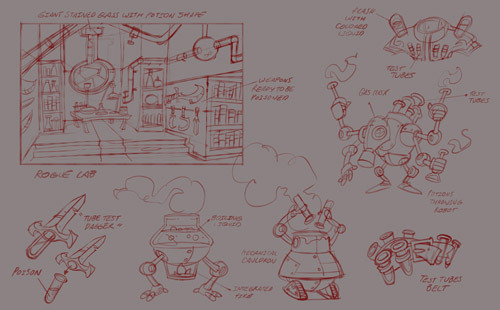 Early on we wanted to explore the different labs inspired by the nine classes, each with a very distinct feel and approach to scientific exploration. 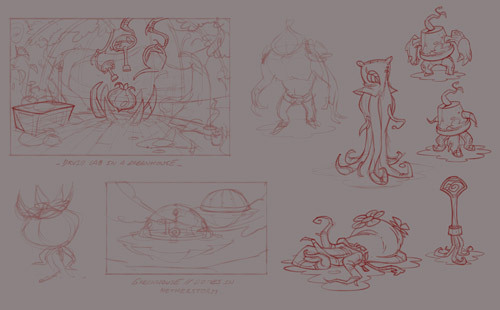 Here we see some early sketches of the mulchy monstrosities that would slither through Flobbidinous Floop’s arboretum/lab. 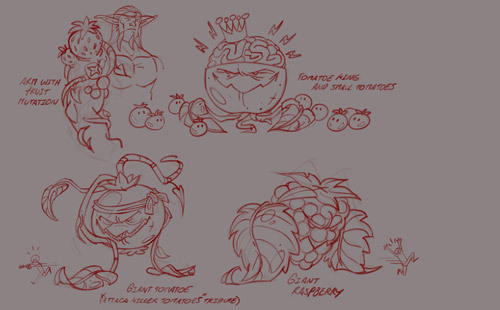 Rogue would undoubtedly be found playing with volatile concoctions. 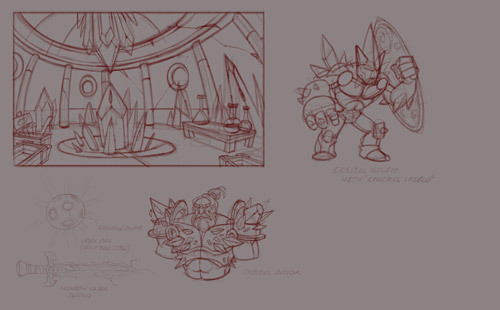 You can see shades of the art that would inspire cards like Necrium Blade and Blightnozzle Crawler. 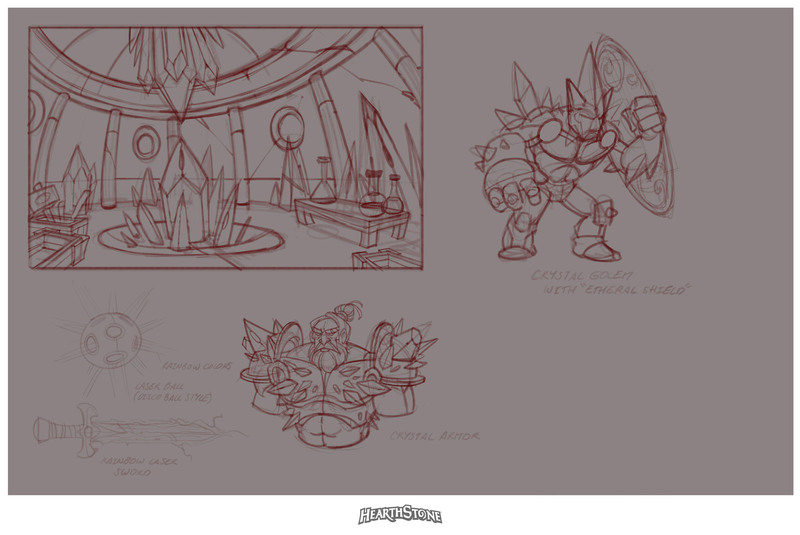 Paladins are always going on about “the light” and one’s faith being put into it, so crystal refracted lasers felt like a natural fit. 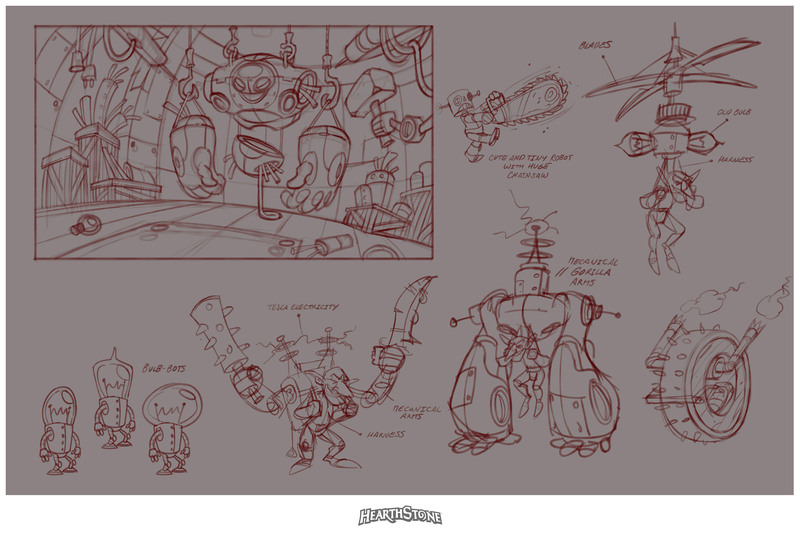 Originally, the Shaman lab focused on mecha-totems, but we pivoted toward Electra Stormsurge, and the raw crackling power of the Netherstorm as designs solidified. 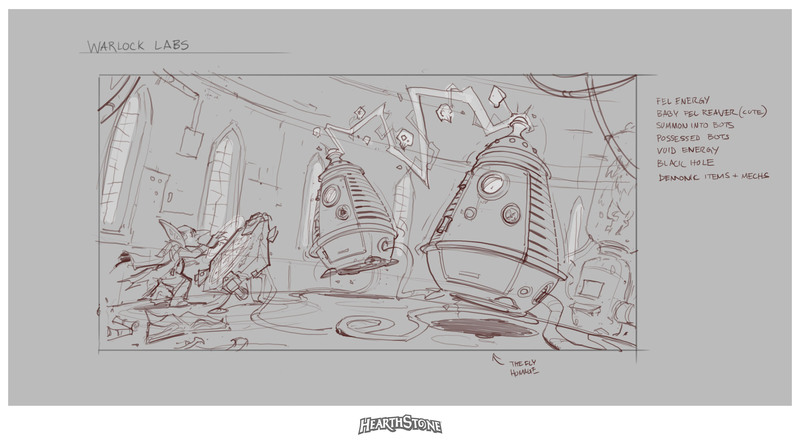 You’ll still see sparks in some of those jars. 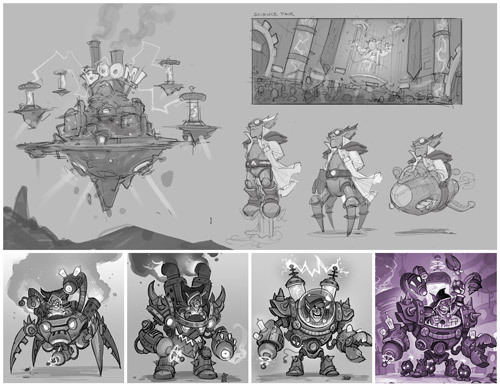 Warlocks were always going to deal in the power of souls, but the look of that technology changed quite a bit from concept to completion to make each class immediately recognizable to the player. 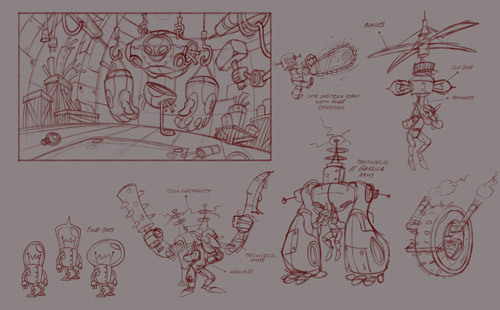 As a lover of all things “mech” Dr. Boom would head up the Warrior lab. 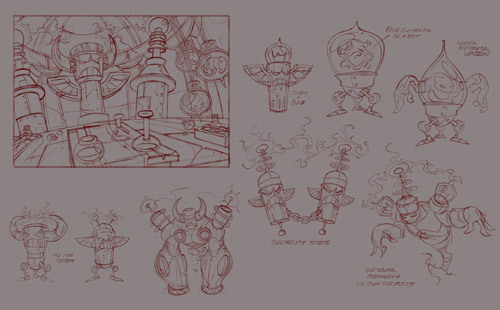 He had to have a workshop full of huge, awesome mechs, and distinctly “goblin” inventions. 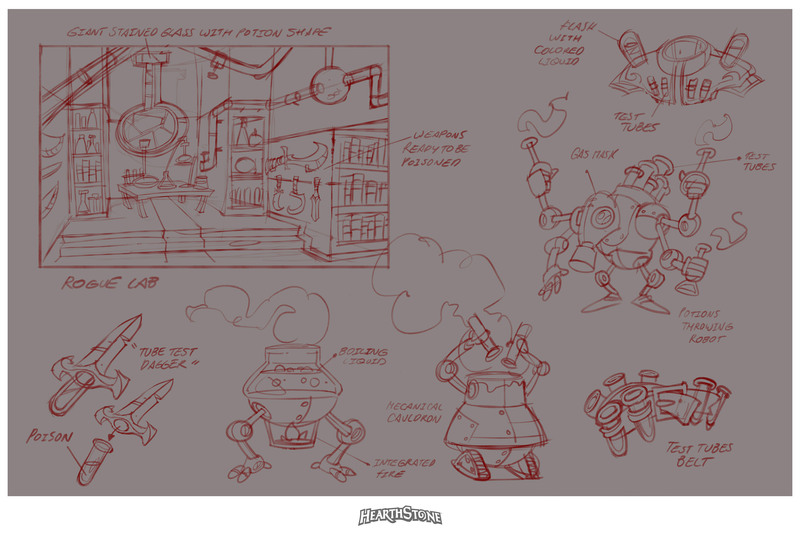 Some of those designs found their way into other Classes or the neutral set. 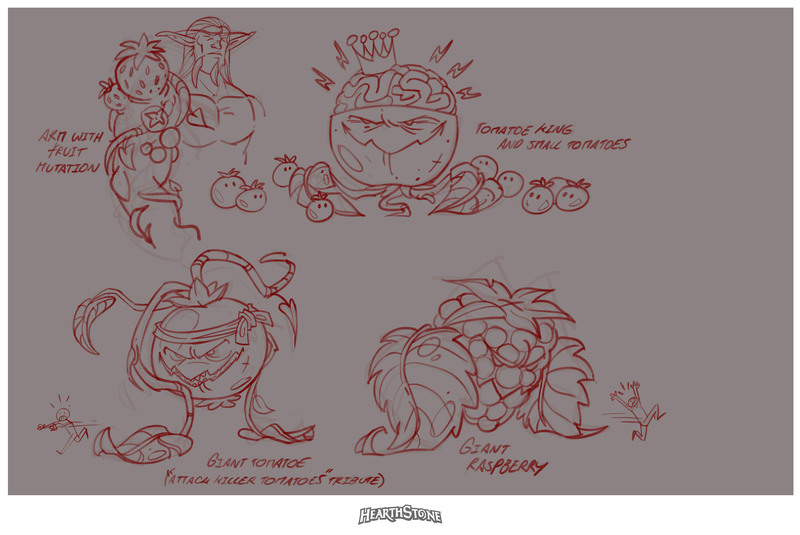 You might recognize the inspirations for Galvatron (sans Chainsaw, sadly) and Faithful Lumi in here (among others). 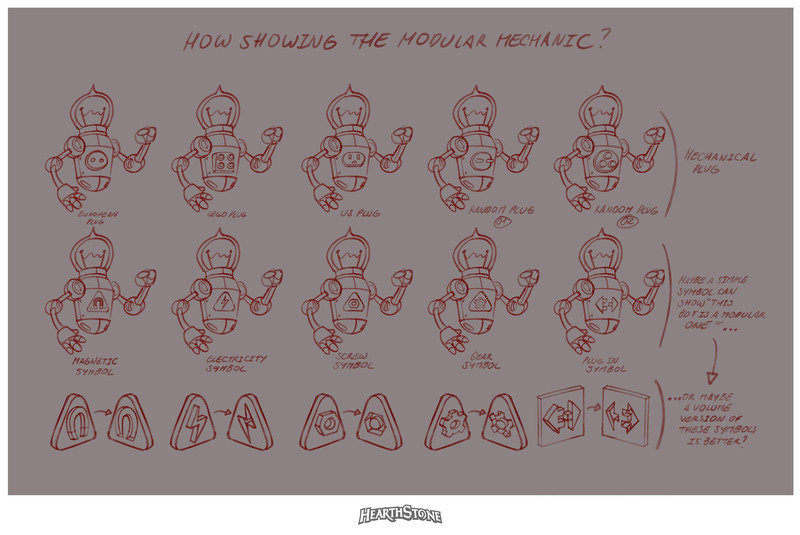 Here are early sketches for how Magnetic (then called “modular”) might be reflected in the art for each Mech. 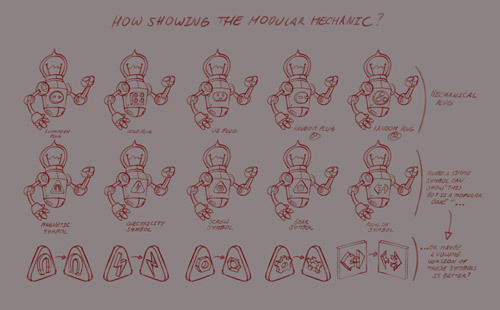 Initially, the symbol on each mech would indicate its magnetic properties. 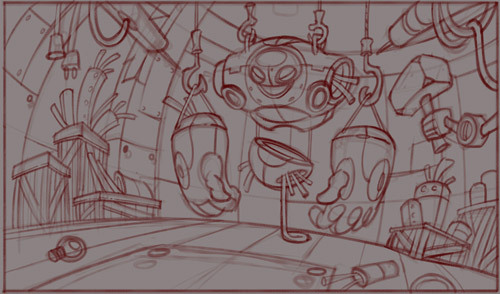 In the end, we needed something more immediately obvious and we ended up going with crackling blue electricity to indicate that the Mechs could connect to each other instead. 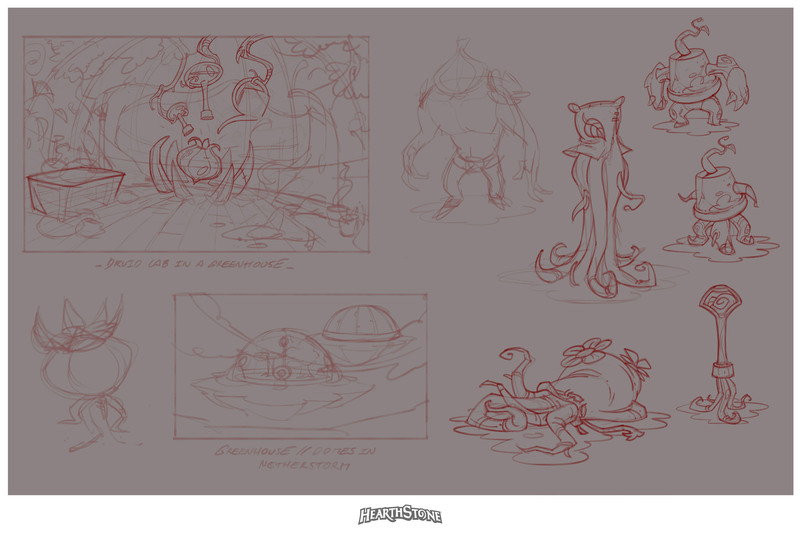 Thanks for joining us for a look at these early concepts, and we hope you’ve been enjoying the resulting art on your The Boomsday Project cards!